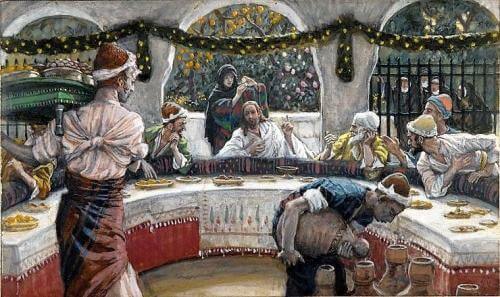 In telling this parable to those dining with Him at the Pharisee’s house, Jesus strikes a chord in their hearts. It is clear that His audience was filled with those who sought the esteem of others and were very concerned about their social reputation. It would have been a frightening thought for them to take the place of honor at a banquet only to be embarrassed by the host when asked to move to a lower spot. This humiliation was clear to those who were caught up in the world of social prestige. We can never examine our consciences often enough concerning pride. Pride is referred to as the “Mother of all sins” for a reason. Pride leads to every other sin and, in many ways, is the source of all sin. Therefore, if we want to strive for perfection in life, we should seek true humility on a daily basis. Humility is nothing other than seeing things as they are. A humble person sees him/herself in the truth of God. This can be hard to do because it requires that we see ourselves as weak and dependent upon God. We may be able to accomplish many worldly things through our own strength and hard work. But we cannot achieve happiness and goodness unless we open ourselves to the truth of our weaknesses and dependence upon God for all things. Humility also helps to purify our hearts of something that is very hard to let go of. Pride causes us to deeply seek out the esteem of others and to be dependent upon that esteem for our happiness. That’s a dangerous road to go down because it leaves us constantly dependent upon the opinions of others. And far too often, the opinions of others are based on false and superficial criteria. Reflect, today, upon how free you are from the misleading and false opinions of others. Sure, you need to regularly seek out advice from those you know and love. But you must allow yourself only to be dependent upon God and His Truth. When you do that, you will be well down the road of true humility. Lord, please make me humble. Strip away all pride in my life so that I can turn to You and Your will alone. Help me to have concern only for the Truth that You establish and to use that as the only measure of my soul. Jesus, I trust in You.